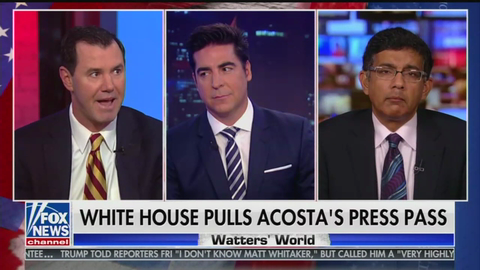 During Saturday's edition of Watters' World, host Jesse Watters and his panel discussed the exchange between President Trump and CNN's Jim Acosta earlier in the week that ultimately concluded with the White House revoking Acosta's "hard pass," at least temporarily. The Hill's media reporter Joe Concha, pointed out that "this is two years of Acosta doing this. It's built to this crescendo." At this point, Concha brought up the media's reaction to Neil Munro, then a staffer for The Daily Caller, interrupting one of President Obama's speeches. Concha read aloud some headlines written in response to Munro's interruption of President Obama. A headline from Politico read "Obama Interrupted by Heckling Reporter," a headline from The Atlantic read "Who is Neil Munro and Why is He Interrupting the President?" In the final example of a blatant double standard, Concha read aloud a headline from Mediaite: "CNN White House Reporter: Obama Heckler Let Him 'Sound Passionate.'" As the segment came to a close, Concha remarked "I don't hear anybody calling Jim Acosta a heckler now."